We had a fantastic trip on near glass calm seas on Tuesday. In addition, it turned out to be a five species day! 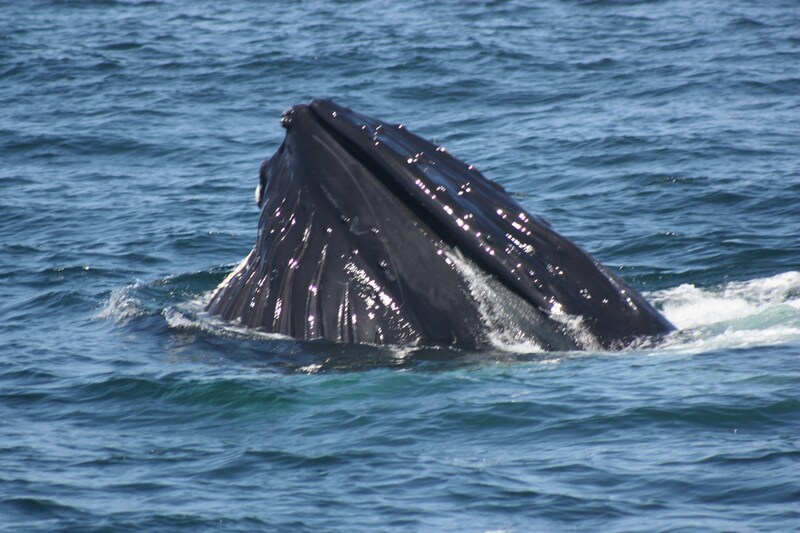 The first whale we watched was a humpback that we saw last week, Sedge. After some great looks at Sedge, we decided to continue on to see what else we could find. 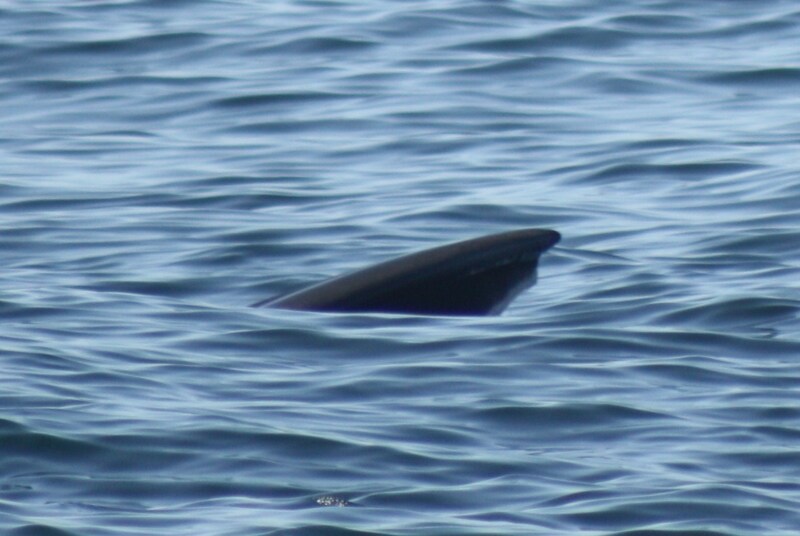 We had a quick glance at a minke whale. Soon after, we encountered another humpback, Hornbill. Hornbill was first identified in 1977, which makes him one of the earlier of the identified individuals in the Gulf of Maine. We can make a very educated guess that this whale is male, as it has never been seen with a calf. We noticed he suddenly changed the direction in which he was swimming a few times, and that sometimes indicates that a whale is feeding (and chasing after a school of fish). 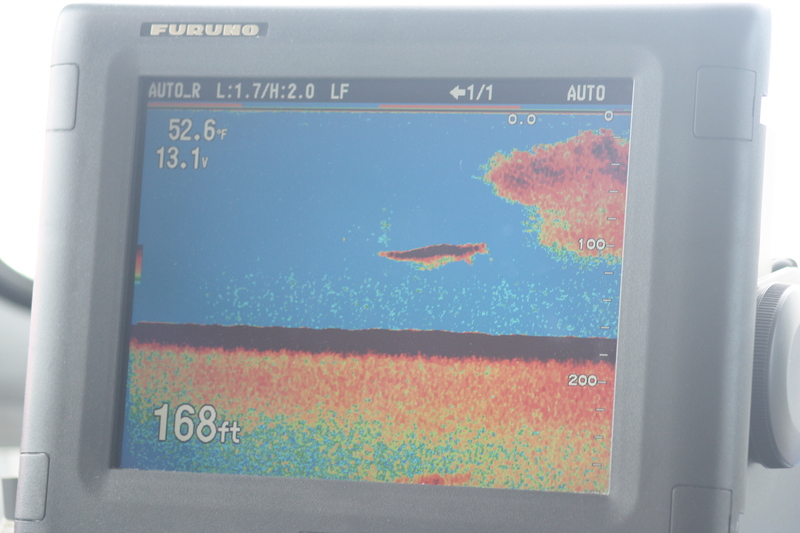 We eventually saw him on our fish finder, approaching a large mass of bait. 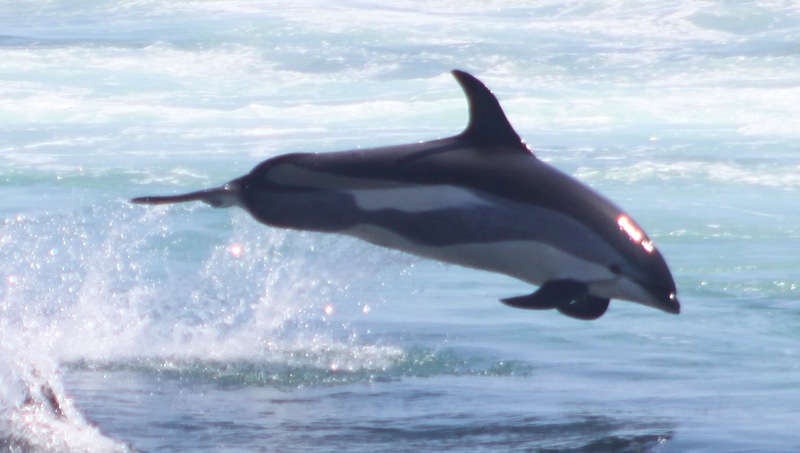 After leaving Hornbill, we were lucky enough to find a trio of Atlantic white sided dolphins. We were just wondering if they belonged to a larger pod when we moved away and found a group of about 100 or more just a little ways away. Not far from the dolphins, we had a great look at a fin whale. Finally, we came across a grey seal who stayed at the surface long enough for us to stop and have a quick look before it dove down into the water. With the number and variation of animals we saw, there was something for everyone on this trip! There were some hungry whales 13 miles from Gloucester today. 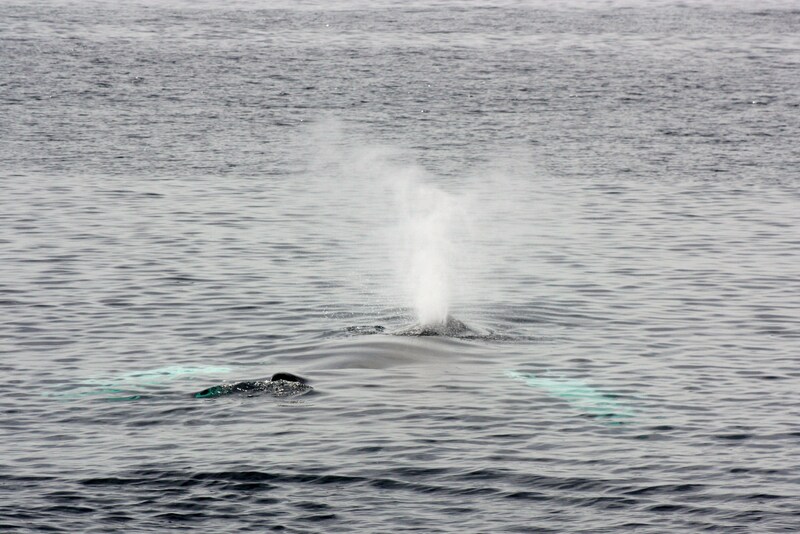 As we watched our first whale, a humpback, I noticed a number of northern gannets flying and diving for fish. Shortly after, we moved over to another humpback that was in the area. We noticed that each time the whale surfaced, a patch of bubbles came up behind it. This indicated that the whale was feeding on fish beneath the surface of the water. 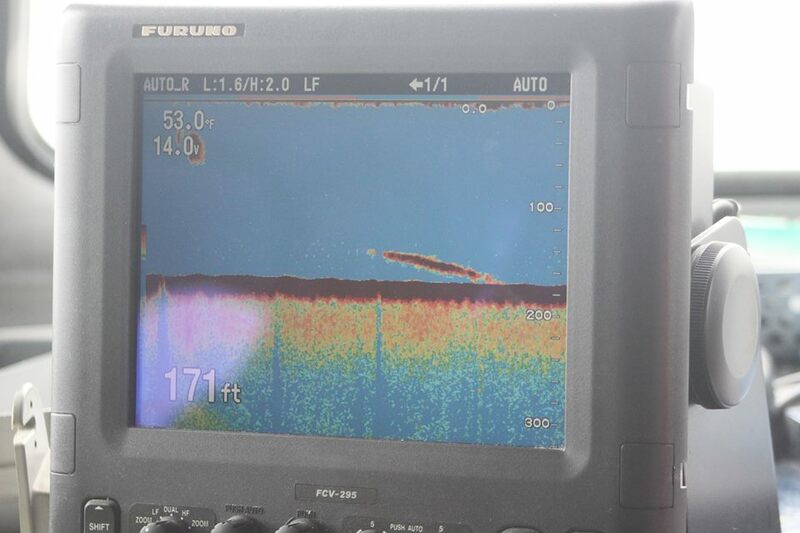 A photo of our fish finder taken by Nancy shows the whale feeding at the bottom, at about 171 feet. There were a few other whales in the area, so we decided to take a look at another humpback, who was also doing some feeding. This whale, Sedge, has some scarring on its dorsal fin that looks like it could be from a previous entanglement in fishing gear. 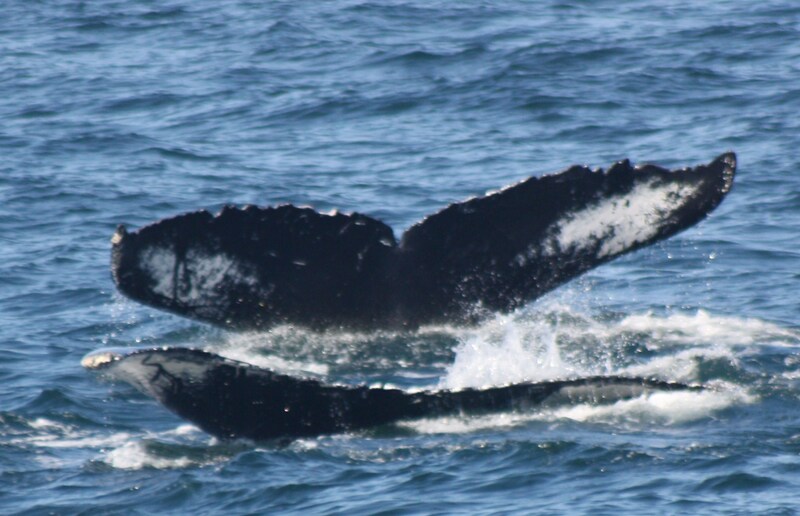 Entanglement is a huge problem for whales and other marine animals. I will have more information about this coming up, and some ways that we can help, so check back soon! 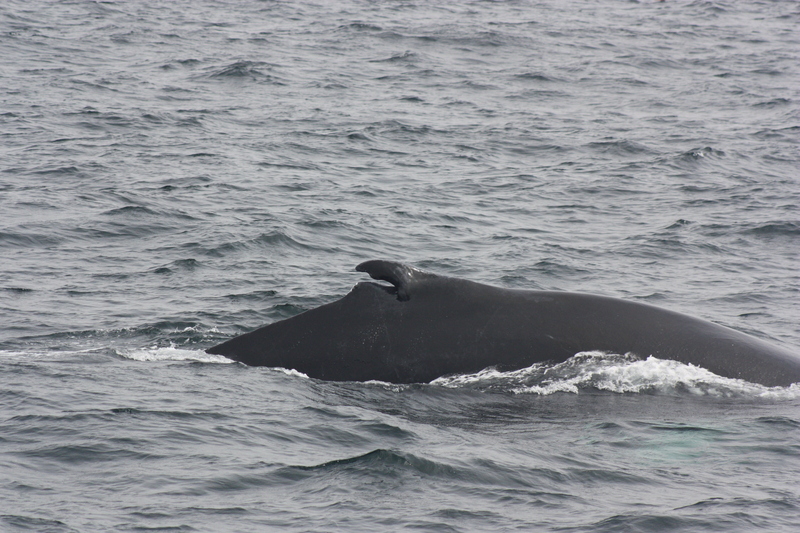 We began by heading north toward Jeffrey’s Ledge, but we soon realized that whales were closer than we were expecting. 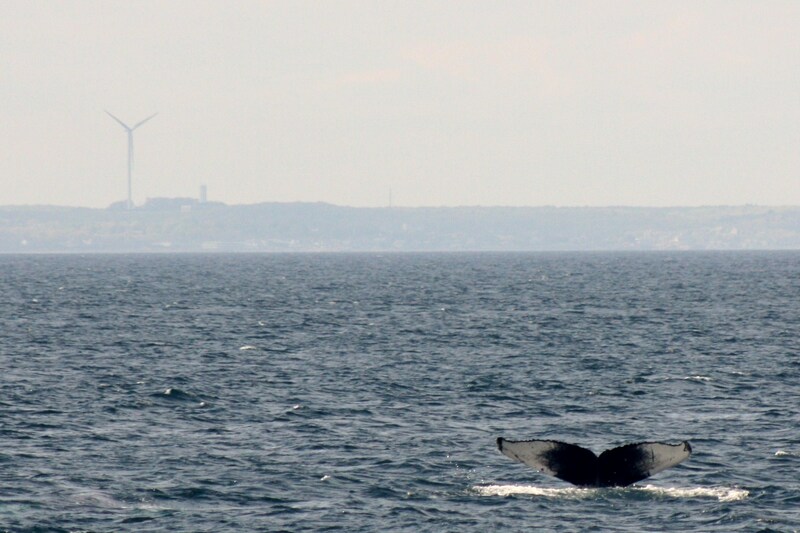 We were only about 11 miles away from Gloucester when we stopped to watch a humpback whale. 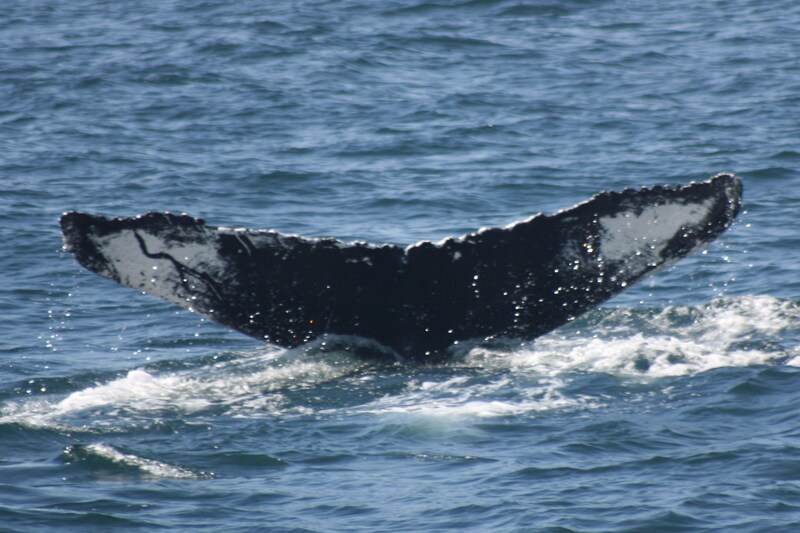 This individual never fluked, so we weren’t able to identify it before moving on to a pair of humpbacks. Nancy identified these two as Pleats and Shuffleboard, both born in 2008. Shuffleboard in front of the Gloucester wind turbines. 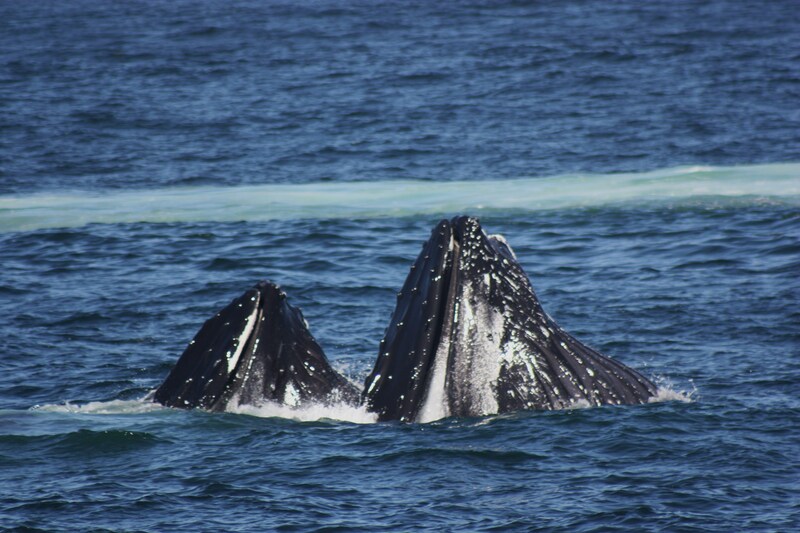 We noticed another pair of humpbacks in the area, so we decided to take a look before heading back to the harbor. As we approached, one of the whales (Moonlight) tail breached! A tail breach is when the whale throws its tail out of the water. This was followed by our first breach of the season! Moonlight was swimming in association with Measles, a whale we saw about a week ago. Can’t wait to see what tomorrow brings! We had another great day in our early whale watch season. We began on a huge pod of Atlantic white sided dolphins, about 200. We were able to watch these dolphins for a long time, and at any given time you could look all around the boat and see them, some swimming far from us, and some right beside the boat! Nancy snapped this great photo where you can see the beautiful markings that make these dolphins one of our favorites. We are so lucky to be able to watch them off the coast of Massachusetts. We were keeping an eye on another animal a little ways away from us, and we eventually made our way over to find a fin whale. We got some great looks at the fin whale, and were able to watch the dolphins swimming along side it. It was really neat to see them side by side and see the huge size difference! Today we had an amazing whale watch. We spent time with unusual species today. We went north up to Jeffreys Ledge and came across patches of copepods. These are the small tiny zooplankton (animal plankton) that right whales and sei whales feed upon. 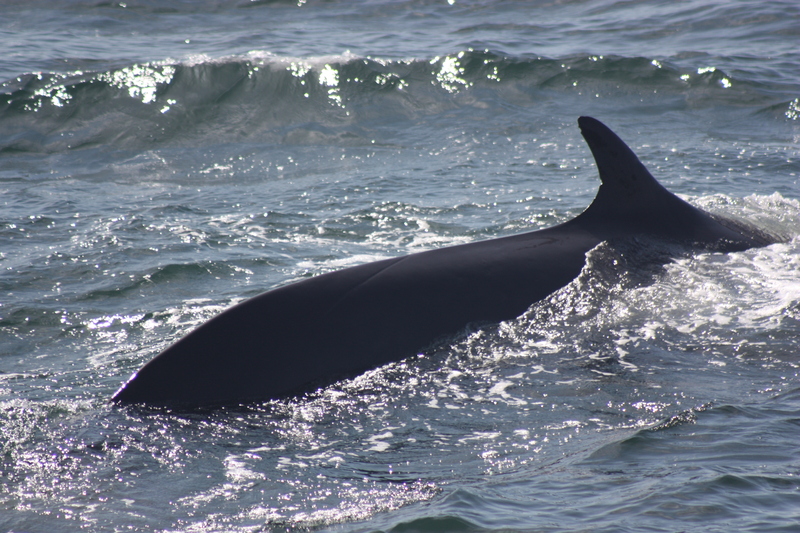 There were probably 4-5 right whales and 4-5 sei whales in the area feeding. 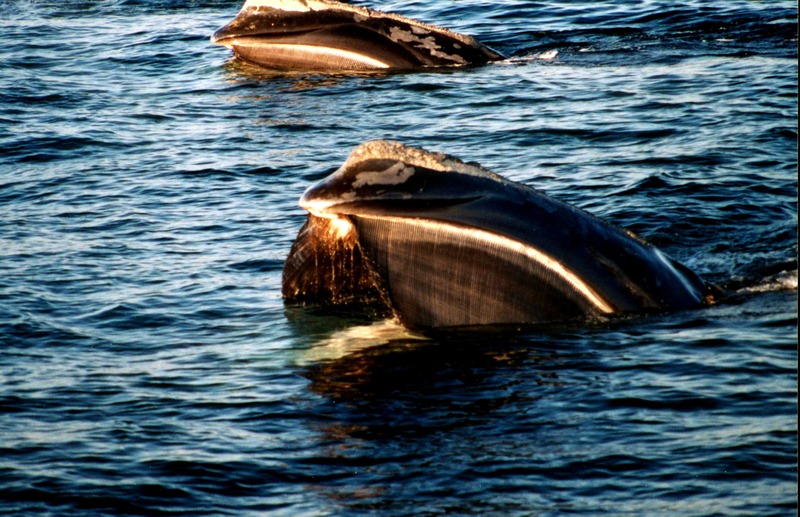 The right whales were skim feeding, holding their head open at the surface, allowing the copepods to go in their mouth and get stuck in the baleen plates. 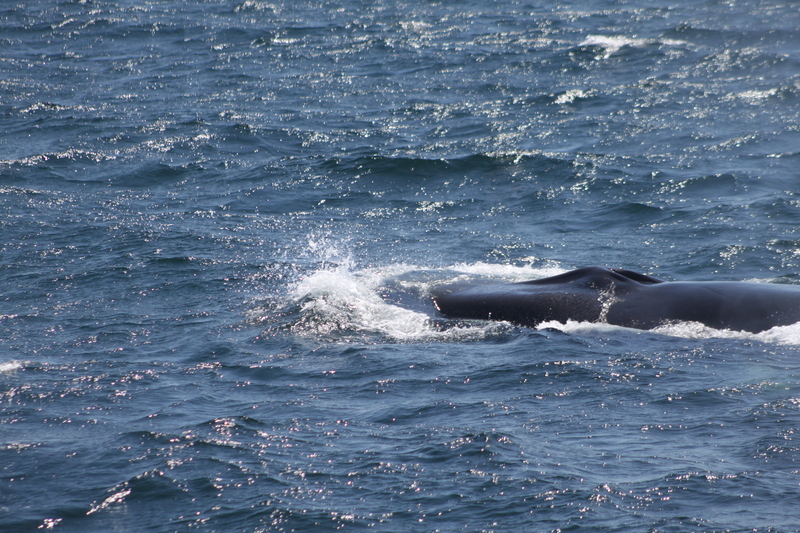 At one point, we could see a right whale skimming in the distance, and a sei whale also skimming. The crazy thing is that their mouths are designed entirely different to both be effective at skimming like that. I would love to know how the sei whale is doing it! Here is a picture of the copepods at the surface! 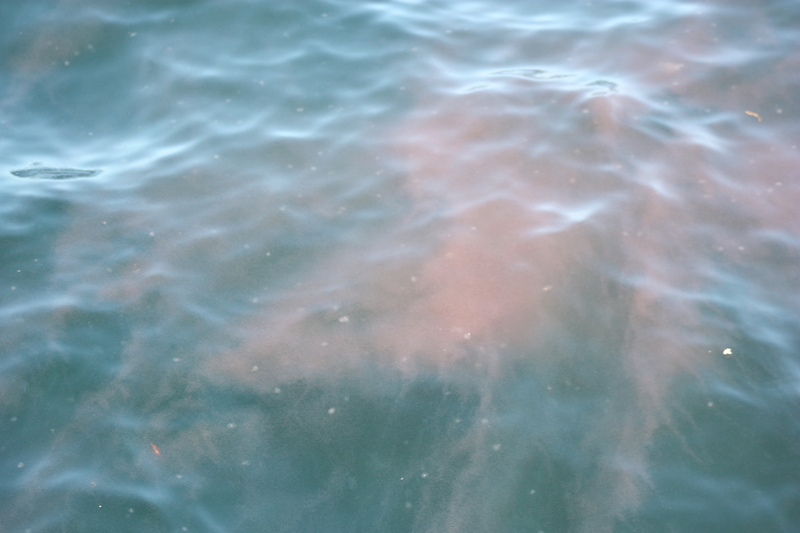 There were so many that the ocean looked red. The little white spots are little comb jellies!